Dentures and dental bridges were long the best options to replace missing or failing teeth. Today, though, there is a better option. Dental implants are the new gold standard. Strong and durable, dental implants can easily last a lifetime. They replace tooth roots, halting and possibly reversing the jawbone loss that occurs after a tooth is lost, and providing a stable foundation for high-quality replacement teeth. One dental implant topped with a crown can replace a single tooth, while a handful of implants can support a full, fixed arch of teeth that never leave your mouth. Whether you need one implant or several, the process is identical. The first step is a careful, thorough examination of your teeth, soft tissues, and bone structure. We will design a precise, individualized treatment plan to meet your goals, desires, and budget. Dental implants must be placed in a clean, healthy mouth. We will fix any existing issues such as tooth decay or gum disease, and then extract your failing teeth. We can place a temporary partial or full denture at the time of extraction so that you are never without teeth. If you do not have enough healthy jawbone to support dental implants, you might need bone grafting. In this simple procedure, we add powdered cow bone or artificial bone to your jawbone and allow it to heal for several weeks before placing your dental implants. Dental implant placement is considered a type of oral surgery. We will thoroughly numb your mouth and then cut a small flap in your gum tissue. Based on the size of the jaw, different size of implant is placed. 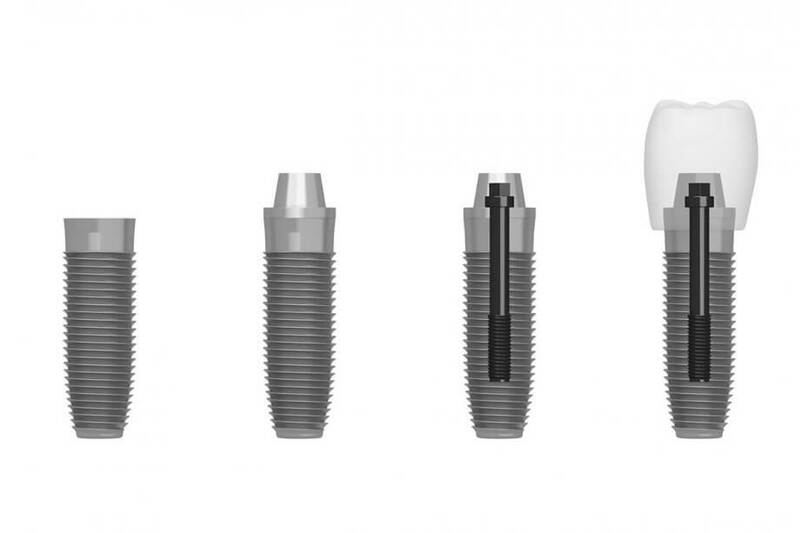 The implant is made of biocompatible titanium, and it is inserted into the prepared site and topped with a healing cap or a cover screw. Finally, we will gently close your gum tissue. We can place as many implants as you need during the same procedure. You will wear your temporary denture for several weeks while the implant fuses with the bone. When the implant is fused with the bone, you will return to our office. We will remove the healing cap or cover screw and replace it with an attachment known as an abutment. Then we will carefully place your final restoration and ensure that it is perfectly fitted. If you need to replace all the teeth on your upper or lower arch, and you have a strong, healthy jawbone, All-on-Four may be the best solution. This revolutionary procedure uses four immediate load implants to attach a fixed arch of teeth in a single appointment. You will never need to rely on a temporary denture, and you can start eating comfortably right away. If you are ready to start your journey to oral health with a compassionate, experienced, and patient-focused dental team, please contact Kensington Natural Smiles at 301-933-3903 to schedule your first appointment. Welcome to Kensington Natural Smiles! Service is at the core of everything we do. Dr. Susan Ho and our Kensington dental team works together to provide a warm, comfortable and relaxing environment. Contact us today to request an appointment.